Shop for skin and coat products to treat your pet's ringworm at VetDepot.com. Ringworm, more correctly called dermatophytosis, is a contagious disease caused by an infection of the skin, fur and/or nails with particular types of fungi. Despite its name, ringworm has absolutely nothing to do with worms. The disease in people can produce a characteristic raised ring, which to someone in the past, must have looked like a worm underneath the skin. "In some cases, a skin biopsy is necessary to definitively diagnose ringworm." Ringworm fungi are found in almost every environment, and any cat, dog or person, and many other species of animals, can become infected if they come in contact with enough of the fungal organisms or if their immune system is compromised in some way. Cats, especially kittens, are most frequently diagnosed with the disease. They also shed a lot of the ringworm fungi when they are infected, so people or pets that have contact with an infected cat or kitten are at an increased risk of developing the disease. The clinical signs associated with ringworm can also be seen with many other skin diseases. If your pet has any of these symptoms, take him or her to the veterinarian. Your vet may use a black light to identify which parts of your pet's body are potentially infected and then will pluck some hairs and try to grow the ringworm fungus in a special type of agar. This test can take several weeks to complete, so in the meantime skin scrapings to look for mites and cytological preparations to determine if bacterial or yeast infections are present can help rule out other causes of your pet's symptoms. In some cases, a skin biopsy is necessary to definitively diagnose ringworm. If your dog or cat's ringworm is mild, medicated shampoos or dips and may be all that is needed to eliminate the infection. Shaving a pet with a long coat can help topical medications better reach the skin and reduce the amount of fungus available to be spread to other animals or people. In more severe cases, a veterinarian will also prescribe oral anti-fungal drugs, such as griseofulvin or itraconazole. For large dogs where cost may be an issue, ketoconazole can also be considered. 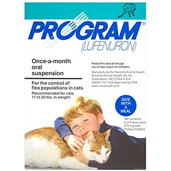 The topical flea preventative Program (lufenuron) may also help eliminate ringworm but should not be used alone. Treatment will need to continue for several months and should not be stopped until follow-up cultures are negative. Ringworm is very contagious, so animals undergoing treatment need to be isolated, and owners should wear gloves and wash their skin and clothes thoroughly after handling an infected pet. Thoroughly vacuum rugs and upholstery and disinfect hard surfaces with a 10% bleach solution to decrease the amount of ringworm fungus in the home. This will reduce the chance that the disease will spread to other individuals in the home or that a patient will be reinfected after treatment is stopped. 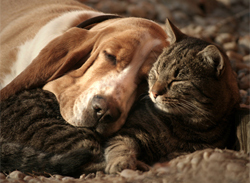 Dogs and cats can also carry the ringworm fungus on their bodies but not show any signs of the disease. Your veterinarian may recommend screening all of the animals in a household to determine if one of them is a carrier that could be responsible for infecting people or pets.